Discussion in 'Developer Diaries' started by MaceMadunusus, Mar 30, 2019. One of the goals for the team for the last two years has been to add some statistics collection into the mix to help us see things from a broader perspective than just the experiences of developers and players that shared their experiences with us. This has mostly been a side project for those working on it, as obviously working on the main parts of the game still take priority when we have a team a small as ours. However, over the last month or so I have made some large progress on the visual front-end using information from the master server with some additional help from Spaghetti. As of the moment of posting about a week of data has officially been gathered outside of the testing environment. Instead of going over the whole process of setting it up, I would just like to give a quick overview of what we currently have and how you can use it. Lets go over the main page first shall we? On the top of this main page, and every other page you will see something like the above. In the very top left you will see a list of filters. These filters such as the Movie Battles Version, Country, and Server can filter the displayed statistics and values based on your chosen input. So if you want to filter by a specific version, or server you can do that. However it is important to note that not all of these will work with every statistic or element. On the top right you have the ability to change view modes, view and change the current time range & page auto-refresh time, as well as a share link generator and manual refresh button. Below that there is the logo and a list of various dashboards that we currently have created based on the data we have. 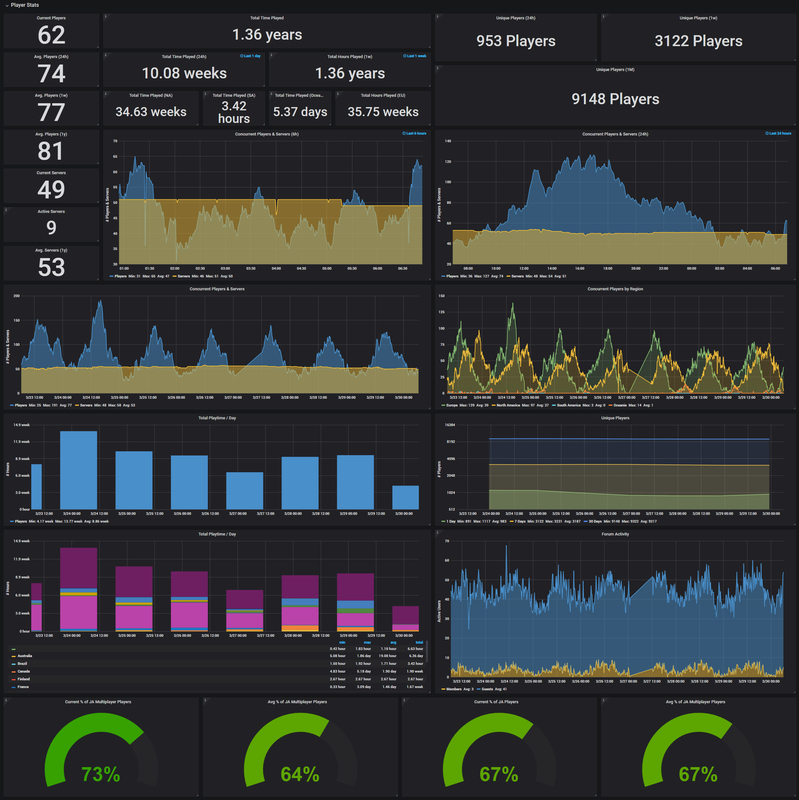 The main dashboard contains things like general player and server count statistics as well as connectivity for the main website and master server. Modes and Maps visualizes various statistics such as time played in the various gamemodes or breakdowns of usages of levels for each of the main gamemodes and more. Player Servers gives a view of the player counts of each individual server over time as well as the current distribution of various flags and settings on those servers. 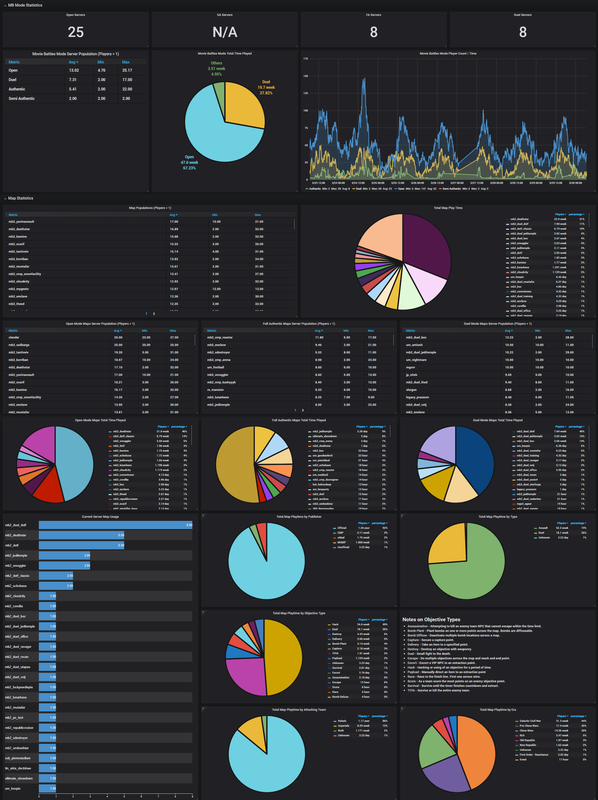 The next two main sections of the main dashboard contains the connectivity statistics for our main servers. This is a combined view from multiple probes located across the world. You can use this view in the future to see if the master server is down everywhere or if it is just you. Now this is where the meat is on the main page. Here you can see visualizations of various player count statistics that we currently have. Depending on the statistic these get polled at every 1 minute, 5 minute, and 24 hour intervals. There is the current/avg player count, total time played, unique players, as well as graph versions of all of those. Panels marked with (24h) (1w) or "Last 1 day" and similar titles are locked to their specific time periods and will not be modified with time region changes. You can view larger isolated views of individual panels by hovering over the top bar of a panel, clicking the dropdown and hitting view. You can also do that by hovering over the panel and hitting V on your keyboard. Hitting V again will return you to the full dashboard. The purpose of this dashboard is mainly to view usage statistics of various maps and modes depending on various parameters. We can see the overall usage of each of the major modes, the more played maps for each mode, and which are the most played based on various types of levels. Maps are all tagged with various properties including their publisher, type, objective type, attacking team, and era. If you would like to isolate some things from the list you can also use clicking and ctrl clicking to select and deselect multiple objects on the list. 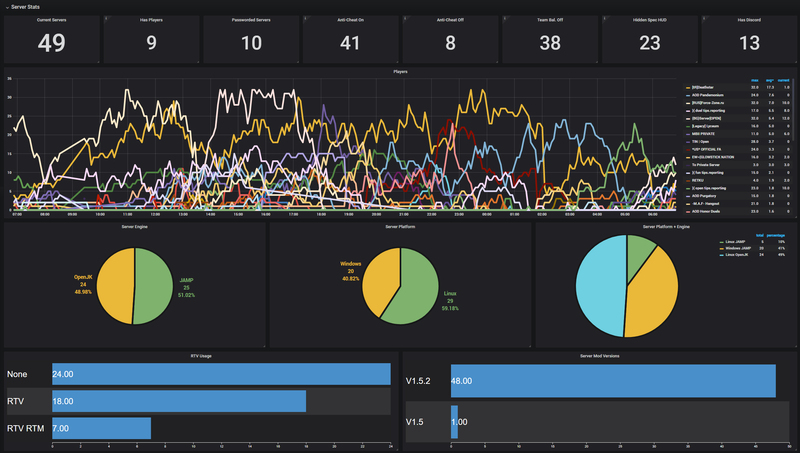 This dashboard is meant to compare the various servers against one another in player counts and general properties. Showing how many servers have players, have anti cheat enabled, are running RTV, etc. Like with the maps section you can also isolate various servers from the graph and other sections by filtering via the top filters or by clicking and ctrl clicking servers in the list. While this is most of what you will be able to see in the near future we would eventually like to expand this further. While plans are not fully set in stone yet and aren't ready to be discussed as a result we will let you all know when we know. Hopefully this can lead to some more in depth in-game statistics so we can compare classes, weapons, etc. My personal wish is the ability to view where various events happen on maps (such as kills/deaths) to identify problem spots that need changing a lot easier. Just ideas for now though! Starting now this front end is available to the public can be viewed here: stats.moviebattles.org or via the top bar here on the forums. WaceMindu, GoodOl'Ben, SK55555555555555555 and 10 others like this. Pretty funny to see we make up more than half of the remaining JKA playerbase.. Not really surprised, but still. Yeah, it would be cool to see heat zones on maps to see where most of the kills/deaths and general camping activity happens.